Unreal Software - Thread: How to disable buy menu? 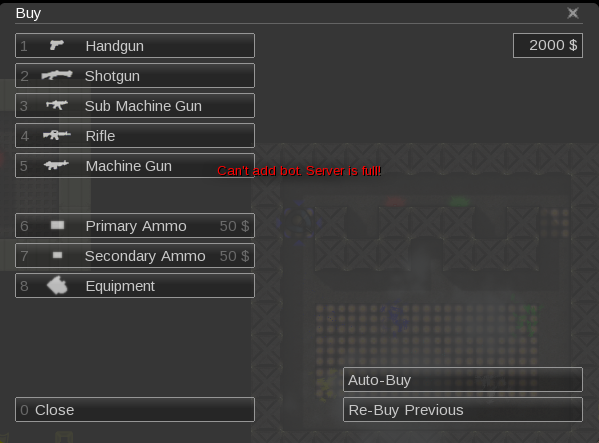 CS2D Scripts How to disable buy menu? How to disable buy menu? Is there any way that this menu is not present when pressing key B? P.S. I know that this is encrypted in the client but there are ways to achieve it, since a server has been configured in this way for a while, see you later. In editor, add entitie : Info_NoBuying in your map for desactived buy menu (menu by defaut and not menu lua). @ dddxdu, LoaderFRA: Unlike the actual CS games, you can bring up the buy menu at all times. Even if the buy time has expired, you are outside of the buy zone, or prohibited from buying due to info_nobuying. @ Cure Pikachu: is rigth. info_nobuying.or not, the menu opens anyways. @ DC: It would be nice if we had access to this too and once and for all changed the traditional menu. For now the only way is to use another key and confuse the users. @ Cure Pikachu: I did not know. In CS:GO, the buymenu is actived at startround only then, if i remenber ?